Neither Scott nor I grew up in particularly religious families, yet whenever we are in France, you can guarantee we will set foot in a church. While we are generally there for the history or the legend rather than any spiritual calling, I’m always reminded that some of the ‘must visit’ churches, including the Cathédrale Notre-Dame de Paris are not tourist attractions but are there for the benefit of their parishioners. This Easter weekend those ‘big name’ cathedrals will be filled with the faithful first, visitors second. On our very first visit to Notre-Dame de Paris we attended mass. We hadn’t planned to be there for mass – it just happened that we were. The whole experience was quite amazing, despite our lack of language skills (French or Latin) or any working knowledge of the Catholic faith. Watching the rituals of the church in such an ancient and cavernous space was quite fascinating and something I’ll never forget. So in honour of the Easter holiday, I thought I would share my favourite Parisian churches – not because they are considered ‘don’t miss’ from a visitor point of view but rather because of they way these special spaces make me feel. Basilique Cathédrale de Saint-Denis. Away from the centre of Paris, out in a working class suburb stands the ancient Basilica of Saint-Denis. It is the final resting place of French royalty and the space is filled with statues of some of those who are buried there, which gives the church a very different feel. The crypt is very interesting and definitely worth visiting. The church usually opens to visitors after formal services are complete. Cathédrale Notre-Dame de Paris. As I mentioned, I found mass here a special experience as I sat beneath rose windows. My imagination was also ignited as I came face-to-face with the fabled gargoyles on the day we climbed to the top of the cathedral. Notre-Dame really is a special place, and I’m so glad it was saved from destruction after the French revolution. Sainte-Chapelle. A royal chapel rather than a church, Sainte-Chapelle has the most spectacular display of stained-glass imaginable. We sat for hours making out the religious stories in the glass and watching the light play in the space. Église de la Madeleine. Without a bell tower or the expected iconology, La Madeleine looks more like a Greek temple than the Catholic church she actually is. I found the interior quite stunning – and very different given the lack of stained glass. The first time we visited I sat for a such a long time just taking it all in. The funeral of fashion legend Coco Chanel was held in La Madeleine. Basilique du Sacré Cœur de Montmartre. I feel the Parisians are a bit unkind when they call Sacré Coeur a meringue, although given its intricately decorated white stone I can kind of understand why. For me, Sacré Coeur will always be magnificent. It was the first French church we set foot in on our first full day in France. I was in awe of everything – and the Basilica definitely fed into that. 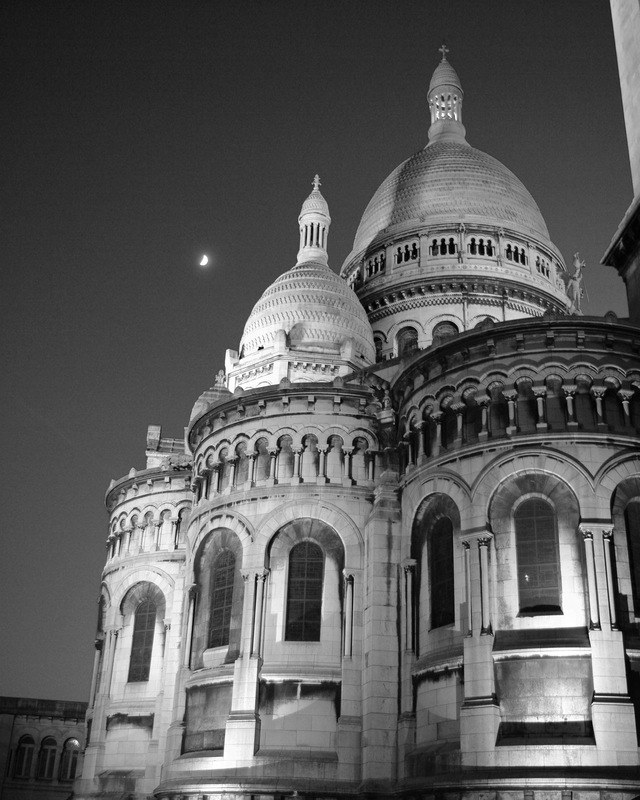 Have you been touched by the beauty of Paris’ churches? If so, I’d love for you to share your thoughts in the comments section below. I have tickets to see the French Violin Orchestra play Vivaldi’s Four Seasons, as well as some other well known pieces, at St Madeleine’s in April. Can’t wait. It is one of my favourite pieces of music and I think it will be spectacular in this environment. Claire – you’ve just given me a big dose of travel envy. That will be simply amazing. Are you on the countdown yet? Your trip isn’t far off now. We’ve gone from year, to months, to weeks and we are nearly down to days. Leaving here on the 17th April. Still not sure what to pack. I’m watching the weather forecasts and will make a decision at the last minute. Things seem to have warmed up considerably this week, with temps in Paris and Bordeaux reaching 20. It is very much like the weather we are currently having here in Hobart so I think that will make packing very easy. Sainte-Chappelle is definitely my favorite. I also like St. Joan l’Evangeliste across from the Abbesses metro in Monmartre (ugly outside but surprisingly pretty inside) and St. Sulpice on the Left Bank. And the Grand Mosque, which is serene on the religious side, with a little garden, and which has an awesome tea room, restaurant, shop and hammam on the back side. Going South in The VAR, you will find a wonderful, welcoming and joyful Anglican church in San Raphael; St John the Evangelist, just one full block up from the sea. My husband and I attend there each year during our 2-3 months in Provence in the spring. My cooking classes either stroll the wonderful Sunday morning market while we attend or they join us at St. John’s. People from all over the world attend and you will be welcomes warmly. Service 10:30 am. It sounds delightful Karen. Thank you so much for sharing. When in Provence visit St. John’s the Evangelist in San Raphael on Sunday at 10:30 am.. A wonderful Anglican church full people from all over the world. Warm, welcoming and a good coffee/wine hour after the service…Good choir and organ music also. One block up from the sea. Opps. Didn’t realize I had sent the original message. It’s is wonderful here in Provence and the sky is so blue today. Sitting on the terrace of Café du Cours in Cotignac finishing a delicious cheve chaud salad and some chilled rose wine. Life is good !